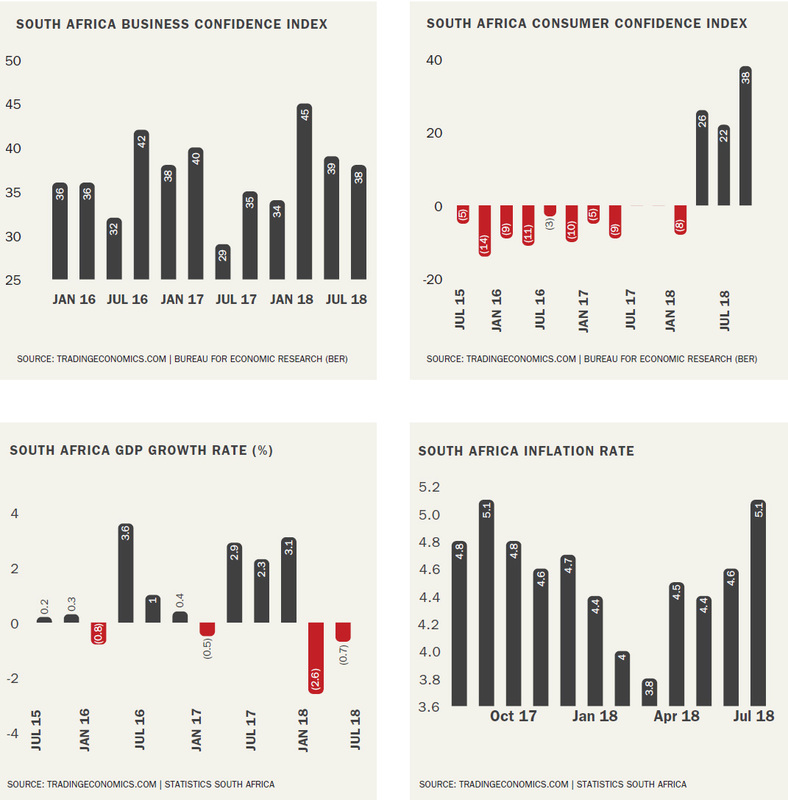 While South Africa’s gross domestic product (GDP) grew 0.4% year on year for the quarter to June 2018, two consecutive quarters of contraction in GDP means that the local economy is in recession. Although headline CPI stood at 4.6% at the end of June 2018, the economic reality is that actual inflation applicable to goods and services purchased by the average person is more than this number. Consumers’ disposable income is eroded by increasing healthcare, education, transport, utility, property and food costs, in addition to the increase in the VAT rate and the absence of inflation-linked tax relief for taxpayers. Most recently, the politically charged discourse on land reform has added to negative sentiment. This has resulted in sustained low levels of consumer and business confidence, and continuing pressure on franchisee profitability. The restaurant market is facing increased competition due to the growing presence of independent restaurants, new brands, international restaurant and fast food brands, as well as the availability of quick meals from convenience stores and supermarkets. To grow revenues, Spur Corporation depends on a ready supply of prospective franchisees with the necessary funds to invest. Economic concerns and increased risk aversion have resulted in it becoming more difficult for franchisees to secure debt funding for refurbishments and new restaurant development. For existing franchisees, increases in the cost of meat, fish and vegetables reduce profit margins. This affects their return on investment and ultimately impacts the financial sustainability of the business. Multiple droughts across South Africa will continue to impact the price of goods for the foreseeable future. In response to this challenging environment, it is necessary that we maintain exceptional operational discipline, backed by innovative marketing to attract consumers and prospective franchisees. Our network of well-established and diverse brands serves a full range of customers and offers consistent value at multiple price points. Our customer loyalty programmes across our brands also offer value for money. Our priority at Spur Corporation is to create value for all our stakeholders. This means not only growing revenue, but also creating a business that is sustainable over the long term. Therefore, after analysis of sales and costs, coupled with extensive franchisee engagement, we made the strategic decision to move away from relying on discounting to drive restaurant sales growth, at the expense of franchisees. This strategy was implemented in the Spur brand in the fourth quarter of the 2017 financial year. This has tempered sales growth, as expected, but has improved franchisees’ profitability and resulted in a more sustainable franchise business. Based on this success, a similar strategy was implemented in the Panarottis brand in the second half of the 2018 financial year, and is being considered in other brands. Despite low growth in restaurant sales, our franchisees are in a healthier financial state than they were a year ago. Our growth strategy is further underpinned by the enhancement of our mainstream brands to meet evolving consumer needs, as well as the acquisition of fledgling brands. The focus in our mainstream restaurants is to deliver quality, high-value brands through continuous improvement of our operational fundamentals, labour and energy cost savings, and service and product innovation. To this end, we refurbished 14 restaurants across the group and reviewed the menus of all our brands to ensure that we continue to give consumers consistent value. The group plans to increase market share by capitalising on the growing delivery opportunity through services including Uber Eats and Mr Delivery as well as “call and collect”. These services are becoming increasingly popular across all brands. Management recognises the increasing role of digital technology in customers’ social and purchasing behaviour and will, as a result, be launching new e-commerce apps in the year ahead which will cater for on-line ordering and payment facilities, earning and redeeming of loyalty benefits, e-gifting, links to delivery services and product promotions. Effective 6 November 2017, the group disposed of its 30% interest in rib processing plant, Braviz Fine Foods, following operational challenges experienced at the plant. Effective 1 March 2018, the Captain DoRegos brand was disposed of. Despite our best efforts, the impact of intense competition and a subdued economy on the brand’s target market, and the relatively low profit contribution per restaurant, meant that the business was not able to deliver the financial performance originally anticipated. During the year, Spur Corporation partnered with experienced Australian restaurateurs to establish the RocoMamas brand in Australia. The first company-owned restaurant commenced trading in Melbourne in June 2018. Using this restaurant as a test case, the group plans to expand the brand on a franchise basis in Australia. To diversify our geopolitical risk, the group’s strategy remains to expand our presence in international markets with stable economic and political environments. Eleven international outlets were opened during the year, with at least another 14 due to open in the year ahead. We have concluded agreements with franchisees in India, Cyprus and Pakistan, and intend expanding into these regions. In October 2017, Spur Corporation celebrated its 50th birthday. The group’s management took the opportunity to review and celebrate what we have achieved over the past 50 years, and to assess what would be required to remain successful and relevant in the years that lie ahead. We have commenced a process of engaging with key stakeholders to define the future of our business. Spur Corporation produced a resilient performance for the year, steadily recovering throughout the year from the significant decline in profitability in the fourth quarter of the 2017 financial year. In the latter part of the 2017 financial year, political and economic woes coincided with the strategic decision to cease excessive discounting in the Spur brand, as well as the social media fallout from an unfortunate incident at a Gauteng Spur. These factors resulted in a significant downturn in sales performance after March 2017, particularly in the Spur brand, which has endured into the 2018 financial year. The group has however steadily recovered during the financial year. Several Spur franchisees found themselves in financial distress during this period and we had to support these franchisees financially to ensure ongoing sustainability, both of their businesses and of the group. Fortunately, because of the steady recovery during the year, the extent of the financial support that we have needed to provide to franchisees has steadily reduced over the same period. The upside to this incident has been that the group, as well as our franchisees, have had to consolidate and refocus to continue meeting our customers’ needs. We have prioritised our focus on product quality, service and innovation. There is also a heightened awareness by all stakeholders of the importance of reputation management and the role that social media plays in influencing reputation. We invested in social media tracking software and our social media team has grown to four dedicated social media ambassadors, monitoring and responding to queries, compliments and complaints posted on sites such as TripAdvisor, GoReview, Facebook and Twitter. Negative comments are forwarded to the customer service centre for logging and resolution. In addition, our customer service centre handles approximately 120 000 queries a year, of which only a small fraction are complaints. Customer interactions increased by 16% during the year under review. Of these, 76% were queries, 18% were compliments and 6% complaints. Franchised restaurant sales increased by 0.6% to R7.2 billion, and by 1.3% to R7.1 billion excluding Captain DoRegos. Excluding Captain DoRegos, franchised restaurant sales in South Africa grew by 1.5%, while international restaurant sales decreased by 0.7% in rand terms and increased by 2.7% on a constant exchange rate basis. Excluding Captain DoRegos, which comprised 46 restaurants at the date of disposal, 55 new restaurants were opened during the year, and 27 closed, taking the number of restaurants to 575, of which 62 operate outside South Africa. Local restaurant sales for Spur Steak Ranches declined by 9.3% in the first half and 3.2% in the third quarter, but increased by 14.8% in the fourth quarter, resulting in a 2.8% decrease for the full year, clearly indicating the extent of recovery during the year. Despite the challenges facing the brand over the past year, we managed to maintain the number of restaurants at 290 (2017: 289). The pizza and pasta division grew restaurant sales by 4.2% for the year, while the number of local restaurants increased from 86 to 92. The domestic pizza market is highly competitive with several major chains following aggressive discounting strategies. Wood-fired pizza ovens have been introduced in selected outlets to enhance product quality and save on electricity consumption and will be rolled out to at least another 10 restaurants in the new year. RocoMamas restaurant sales increased by 31.5% as 15 restaurants were opened in South Africa. The brand has grown from five outlets when we bought the business in 2015 to a national footprint of 65 restaurants. The brand’s quality and innovation continue to attract strong support from the urban millennial market. John Dory’s restaurant sales grew by 0.6% with the performance impacted by the temporary closure of two major outlets for shopping mall redevelopment. The number of restaurants increased from 48 to 49 during the year. The Hussar Grill grew restaurant sales by 24.4%, assisted by the opening of three new restaurants, taking the number of local restaurants from 14 to 17. While the chain’s upper income customer base continues to be more resilient than the middle-income market, there are signs of increasing pressure on these customers due to the state of the economy. At a constant exchange rate, restaurant sales in Mauritius (11 outlets (2017: 10 outlets)) increased by 18.7%, Africa (38 outlets (2017: 36 outlets)) increased by 7.4%, and the Middle East increased by 146.4% (two outlets which opened during the prior year) while sales in Australasia (11 outlets (2017: 12 outlets)) were 16.9% lower due in part to the closure of two Panarottis outlets during the year. The Mauritius operation continues to trade well, and Africa generally performed in line with expectations, although trading in Kenya and Tanzania was impacted by political issues, Zambia by the outbreak of cholera in the region and Namibia by tough trading conditions similar to those experienced in South Africa. The trading environment in Australia, which is a resource-based economy, has been particularly challenging, compounded by high labour costs, which has put pressure on the franchise model in the country. Based on the performance of the operations in Australia, the group is re-evaluating the business model in that country with the aim of implementing technology solutions to reduce labour costs while actively engaging with landlords and franchisees to reduce restaurant sizes to ensure the sustainability of the business. Revenue from continuing operations increased by 3.0% to R667.2 million. Revenue was impacted by the franchise fee concessions granted to assist several Spur franchisees in the aftermath of the Spur social media incident. Franchise revenue in Spur declined by 3.2% and increased in Pizza and Pasta by 2.6%, John Dory’s 2.0%, The Hussar Grill by 33.6% and RocoMamas by 37.8%. Revenue from the manufacturing and distribution division increased by 2.4%, negatively impacted by lower restaurant demand for manufactured and centrally procured items. Margins came under pressure across all divisions in South Africa, except for RocoMamas, as operational costs (mainly employment costs) increased ahead of revenue growth. The manufacturing and distribution margin declined due to higher input costs which were not passed on to franchisees, and lower volumes of products supplied to franchisees. Profitability in Australia was negatively impacted by lower revenue, impairments on loan receivables to franchisees, and costs related to establishing the RocoMamas business in Australia and the opening of the first RocoMamas outlet in the country. The international business benefited from initial licence fees received in Cyprus and India in advance of opening in these countries. Mauritius and the Middle East performed well although operating profit in Africa was static owing to the high cost of servicing these operations and weaker local currencies impacted revenue growth. The worldwide paradigm shift relating to social and environmental sustainability has been profound, and consumers support brands with clear positions on sustainability, fair and just employment practices and that are active in their communities. Sustainable business practices also attract the right talent and investors, ultimately enhancing the group’s reputation and leading to sustained financial growth. Therefore, operating in a sustainable manner is crucial for Spur Corporation. We focus on financial, social and environmental sustainability and set clearly defined targets and objectives to guide actions and outcomes in this regard. The group’s regular review of social and environmental risks, legislative requirements and best practice feeds into strategic discussions throughout Spur Corporation. In 2018, several factors pointed to the importance of environmental sustainability. Globally, the biggest social conscience trend was a significant shift in awareness around plastic pollution. In South Africa, this global movement as well as severe water shortages in the Western and Eastern Cape initiated consumer pressure across the group’s brands to tackle environmental issues. Spur Corporation is committed to good corporate citizenship. The board is responsible for the application of integrated thinking as encapsulated in King IV™*, which will protect our ability to continue sharing value with our stakeholders. We understand that, by engaging our key stakeholders meaningfully and in line with King IV™, we can gain insights into their needs. Details of our stakeholder engagement can be found here. Spur Corporation’s success and business objectives are dependent on the talent, skills and expertise of its employees. Huge emphasis and value are placed on ensuring that we have a skilled and diverse workforce. The group’s investment in skills development is crucial to ensure we support and harness the best from our human capital. Training and development initiatives provided to franchisee employees further ensure that quality and service are maintained at the highest standard. Spur Corporation, along with many of our franchisees, is active in communities through various corporate social investment (“CSI”) initiatives that aim to make a positive and lasting difference. Managed by The Spur Foundation, our CSI initiatives reflect its motto “Nourish, Nurture, Now!” through feeding and education programmes for children and the provision of necessities and amenities. Spur remains committed to the undertakings made by the industry to the Department of Health and, “Better for You” meals, or healthier swap recommendations now feature on the kids’ and adult menus of Spur Steak Ranches, Panarottis and John Dory’s. Further details on these initiatives can be found in the online sustainability supplements. In an environment of increasing financial pressure on the group’s middle-income customer base, with little relief expected in the short to medium-term, the group’s focus will remain on product quality, value, customer experience and innovation to retain and grow the customer base and ensure that the franchise model is sustainable. In the next year, we plan to open at least 29 restaurants across our brands locally, and at least 14 restaurants internationally. The expansion will focus mainly on Africa where new outlets will be opened in Zambia (eight), Namibia (two) and Botswana (one). The group’s first restaurant will be opened in India (RocoMamas) with a further two outlets planned for Saudi Arabia (RocoMamas and The Hussar Grill). The group is also in advanced negotiations to expand into Cyprus (RocoMamas) and Pakistan (Spur) where potential sites are currently being assessed. We would like to thank our shareholders and other stakeholders, and particularly the staff of Spur Corporation, for the hard work done behind the scenes to make the group a success. We thank our franchisees for their unwavering commitment in difficult trading times. Despite significant pressure on their margins, they continue to trade aggressively and capitalise on opportunities to grow market share. Finally, we thank our customers for their continued patronage of our business. 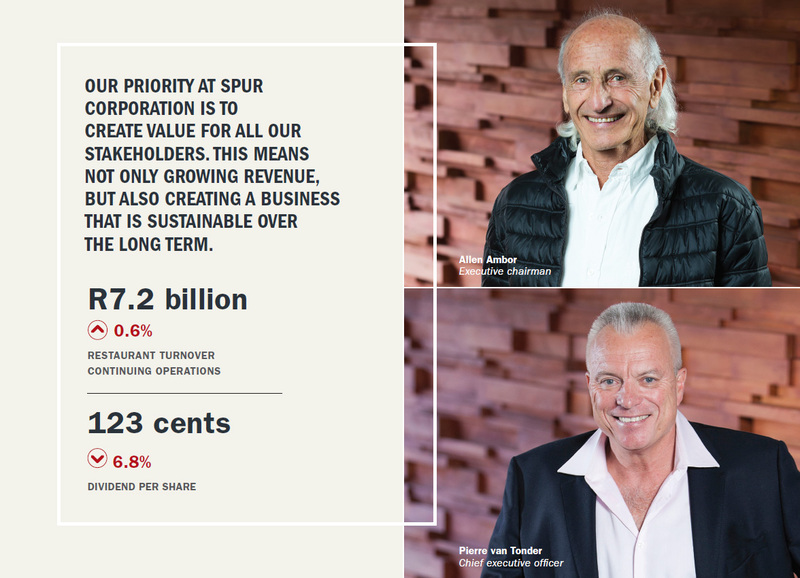 Spur Corporation founder and executive chairman, Allen Ambor, is to retire from the company and the board, effective 1 March 2019, after 51 years’ service. Allen (77) founded Spur when he opened the first restaurant in Newlands, Cape Town, in 1967. He has served as executive chairman of the board since the company’s listing on the JSE in 1986. On behalf of the board, we thank Allen for his unrivalled passion, commitment and inspiration over the past five decades in building Spur Corporation into the market-leading business that it is today. He has overseen the growth of the business from a single outlet to a multi-brand franchisor with over 575 restaurants in South Africa and internationally. The nominations committee of the board is in the process of identifying a new board chairman.